Dear Jenny, thanks for this resource rich post. I enjoy your very helpful links to the Handbook of Reflection, the Four Lenses and Researching your own practice. I have noticed with adult learners in skills training, that a resource and information poor schooling background, seems to leave them with a tendency not to analyse, evaluate and reflect. Their responses tend to be impulsive and emotive, (this goes for workplace contexts as well). I find that they need to be trained to do this in a very explicit way. I find Bloom’s Taxonomy a useful tool for this. We have outcomes here in South Africa called Critical-Cross-Field Outcomes, (or key competencies elsewhere). The one I find of particular interest is called critical-cross-field-outcome collecting: where the learner is required to collect, organise, analyse and critically evaluate something, situation, or scenario. I find this very useful for getting learners to do this in a sequence, say by researching something to write a simple report and make recommendations. This then helps them reflect on their thinking and processes. But, it can be hard in the beginning because it is an unfamiliar process. Reblogged this on red rabbit skills services | skills programme development and related services. I should have probably included more evidence and taken a specific example to build upon it. But would that summarise my overall experience as a teacher? In hindsight, yes… we all learn when we know why new information matters; otherwise we don’t reach new meanings! We, as librarians tend to be dogmatic and oppose Google, Wikipedia etc as if we are in a war with giants. Do we tell students why they need to be cautious? Librarians in the States recently realised that this is the way forward and named it a “Real deal” Information Literacy. For me, is a “real deal” teaching probably derives from my cultural background where childrens’ questions didn’t have answers but the word “because” as an explanation. I wonder if there’s something about failed scientists (“come from”) that makes us pessimists. Great post, Jenny! You had me right at “I am definitely a glass half empty person” without apology, and your working through what that means in a reflective practice manner is just icing on the cake! Good post and helpful information I should have read a few days ago! The half empty person not only knows what they are talking about (at least the first half anyway). Hi Carol – many thanks for your comment and for sharing the approach you have in South Africa. I agree that personal story telling is a very helpful approach when starting to develop reflective learning skills and your critical – cross -field – outcomes (what a mouthful :-)) approach seems to fit the bill. I think Jenny Moon’s work is useful because she describes in depth how to extend personal storytelling into something deeper. Some people seem to do this naturally – for others its more of a learning process. One of the problems we have when we ask people to engage in reflective writing as part of a course requirement, is that they might see it as a hoop to be jumped through rather than something of personal value for themselves. I haven’t seen any ‘hoop jumpers’ in this Mooc yet, but I have seen many in my teaching career. The problem with having reflective writing as an assessment requirement is that it tends to come at the end of a block of work rather than being integral to the ongoing work – so may be seen as an add-on, rather than a learning habit to be developed over time – in fact over many years. Thank you Alan, Jeffrey and Scott for your comments – and your quote Scott. You will see from my comment to Eleni that I struggle a bit with the notion of assessing reflective learning. It seems such a personal process. 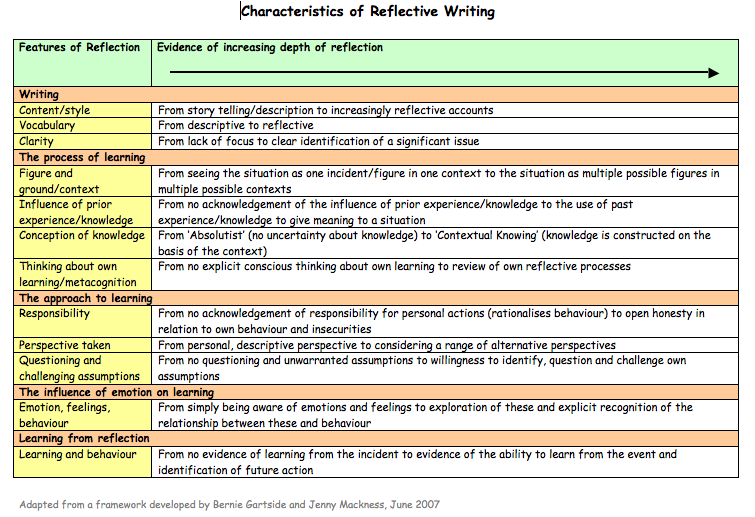 Jenny Moon in her book suggests assessing ‘secondary’ reflection, i.e. asking students to submit a piece of work that is taken from their initial reflections. But of course this takes time – probably more time than we have in this Mooc?